Finally got to use my cutesy animal molds. Made me feel like I was in kindergarten again. Sigh. Cute animals. In my stomach you go! 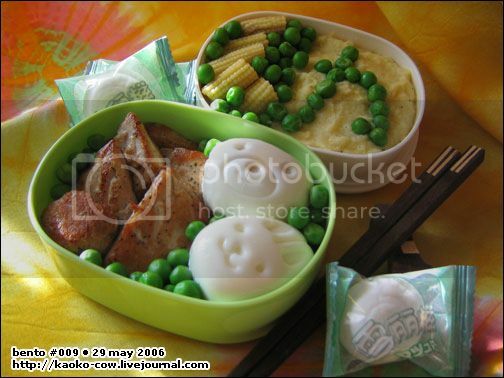 Top tier: Blanched baby corn & peas + Mashed potatoes. Yep, the peas on the potatoes (say that fast) say KA for KA-oko. Bottom tier: Pangrilled Tuna (one’s supposed to be a tuna flower. I don’t think it shows up well on the pic) + Usagi & Kuma eggs. Plus lots more peas to fill in the empty spaces. I also packed in a couple of Green Tea filled marshmallows along in my furoshiki, just as an extra treat.